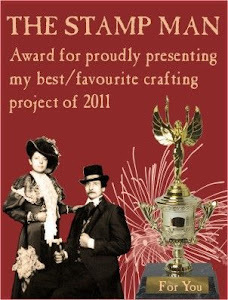 Just a reminder for you about our awards, you have until Thursday evening to enter your best/favourite project of 2011 over on our Challenge blog. 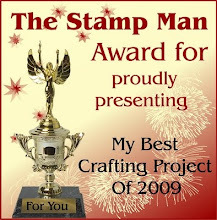 The instructions are given on the post about it but we are holding a prize draw for those that enter for a chance to win £30 of Stamp Man Gift Vouchers plus there are 4 runner up prizes. Our next challenge theme is listed on our Challenge blog HERE if you want to get a head start. Some of you may have noticed that our website is down. What started off as a simple domain renewal has turned into a domain move which has taken longer to change than anticipated. We were told it would take 24-48 hours, we were hoping it would be moved by today, but it looks like it will be tomorrow now. Apologies for any inconvenience this may have caused. Oh, another reminder, we'll be down in Sheffield next Sunday if you want to pop along to a craft show, the details are below. 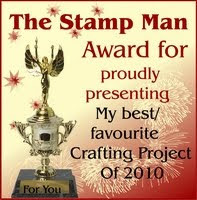 It is the first craft show at Don Valley Stadium for a while so if you are local we hope to see you there! Embossing, Embossing and more Embossing!! !